Jeera, an Indian spice helps to jump-start weight loss, decrease body fat & improve unhealthy cholesterol levels naturally. The presence of Thymol & other essential oils in cumin seeds stimulate the salivary glands there by helping in the digestion of food. Apart from this, they strengthen a sluggish digestive system. Hence, if you suffer from indigestion try drinking some jeera tea. Apart from that Jeera, bananas also help to lose weight. Add a teaspoonful of jeera to a glass of water & bring to boil. Once the water turns brown, turn off the gas & cover the vessel. Allow the decoction to cool down to room temperature. Drink this tea 3 times a day to improve digestion & to help resolve minor stomach ache. Take 2 big spoons of Jeera & soak it overnight. In the morning, boil the water & drink as your morning tea. Chew the soaked cumin. Doing this regularly will eliminate fat from your body. Increase the jeera intake in your food. Add one spoon of jeera powder in curd & eat it on regular basis. Regular use of it will help you in reducing weight. Add 1/4 tsp jeera powder & few drops of Honey in water & drink it on regular basis. Add one spoon of cumin powder in vegetable soup or rice. These small things will make your weight lose easier & tastier. Garlic & lemon both have tendency to cut extra fat from your body. Take carrots & other vegetables & boil them. Add finely chopped garlic & lemon juice to it. Sprinkle some cumin powder. Eat this every night & see some miracle happening to your body. 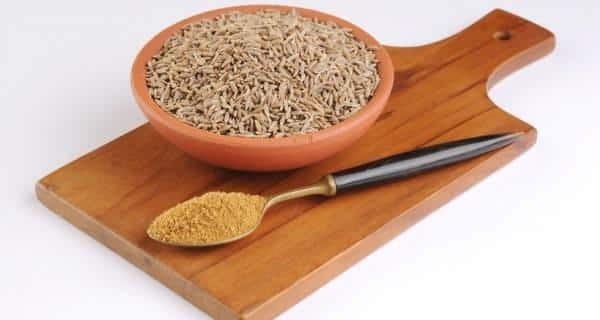 Jeera acts as an antioxidant & increases metabolism rate which helps to reduce abdominal fat. Fat is the main reason behind obesity & cumin helps in cutting fat. Drinking lukewarm cumin water in considered as to re-hydrate the human body & keep refresh all the time. Black Cumin can help in the fight against cancer. This is because it contains an active compound, known as cuninaldehyde that helps in retarding the growth of tumors. Being high in Potassium - a mineral that helps to maintain the electrolyte balance in the body, this seed is an elixir for heart patients. This mineral not only helps in the regulation cell production but also helps to maintain your blood pressure & heart rate. Because of its regulatory properties, jeera helps patients who have heart disease & prevent it as well. It also provides relief from the chills, reduces swellings, relieves breathing difficulties, regulates bowel movements, relieves joint pain & infection, treats umbilical hernia, and treats intestinal diseases, eyes problems & toothache. If you are suffering from body heat & itchiness, you can put some cumin seeds in boiled water. Once it is cooled, take a bath with that water.